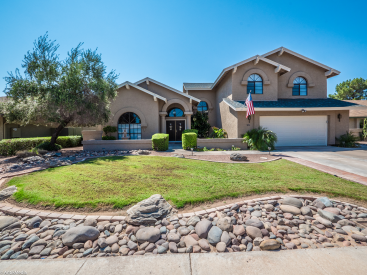 Spaciously Gracious & Beloved UDC 4 Bedroom 3 Bathroom Floorplan Ideally Located in S. Tempe. N/S Lot on Quiet Interior Street. From the Stately Entry outside, to the Soaring Vaults inside, this home lives large. Lovingly maintained by long time owner, this home has updated Chef's Kitchen & Bathrooms, Soothing Neutral Décor w/ Beautiful Woodwork including Solid Stained Wood Doors & Trim. Lovely Used Brick Fireplace & Walk-in Wet Bar in Family Room assure memories will be made here! Tile in all Traffic Areas, & downstairs bath has outside entrance for pool use. Master Suite is Palatial w/Regal Bath & Dressing Area. Updated Pool & Deck in S Facing Rear Yard Complete w/Gazebo & Generous Covered Patio. Oversized Garage, & Best Valley Location w/easy access to the 101 Freeway, this IS IT!! !